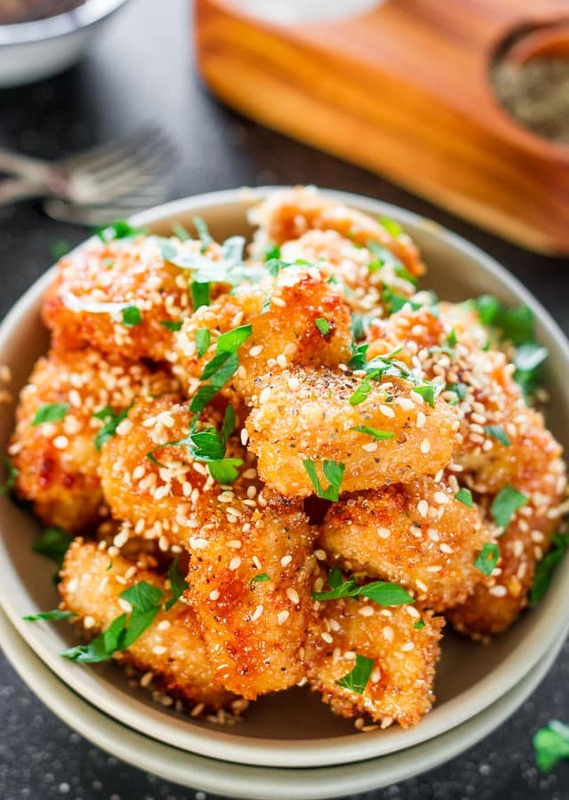 Baked Honey Garlic Chicken – little chicken nuggets, breaded and baked to a crispy perfection, then drizzled with an amazing sweet, spicy and garlicky sauce. Oh this chicken, you guys! It’s sweet, it’s spicy, it’s garlicky and totally delicious. 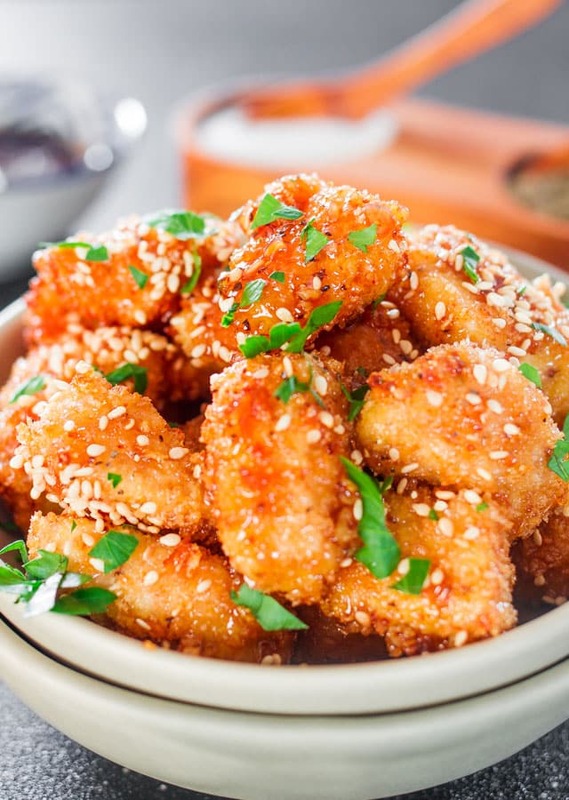 These tiny tender full of flavor pieces of chicken are first baked to a golden perfection, then dipped in this sweet and spicy sauce. True perfection, especially when served over rice or with a side of veggies. 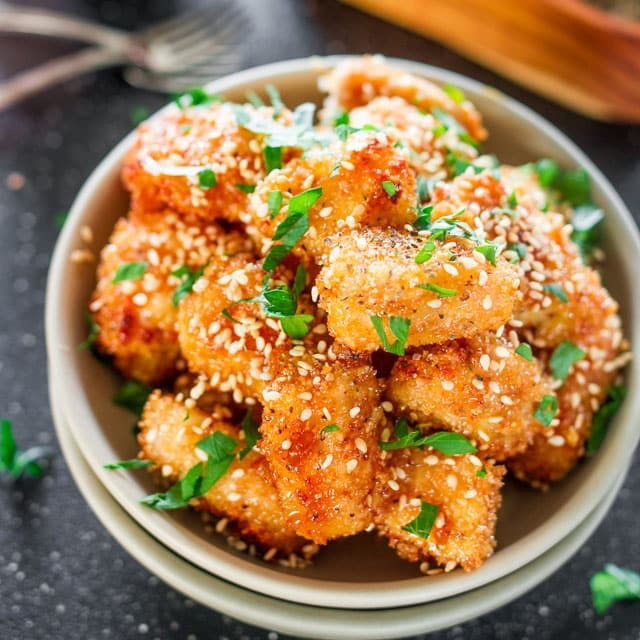 I never get tired of this chicken, and I made similar chicken like this before, for example the Bang Bang Chicken, however that chicken was fried, and so I wanted to make a healthier version. So many of you have written to me and asked if the bang bang chicken can be baked instead and the answer is YES. That’s the beauty of using Panko breadcrumbs, you get crispy chicken whether you bake it or fry it. I would rather eat chicken than beef. It’s as simple as that. I totally love to create all sort of different recipes with chicken and try different flavor combinations. But there’s nothing better than good crispy chicken. That’s why this chicken is perfection. And it’s so simple to make. You beat a couple eggs then season with some salt and pepper and drench the chicken in the egg. This is what helps the breadcrumbs stick to the chicken. Then you take each chicken piece and roll it through breadcrumbs. See this is fun to make. 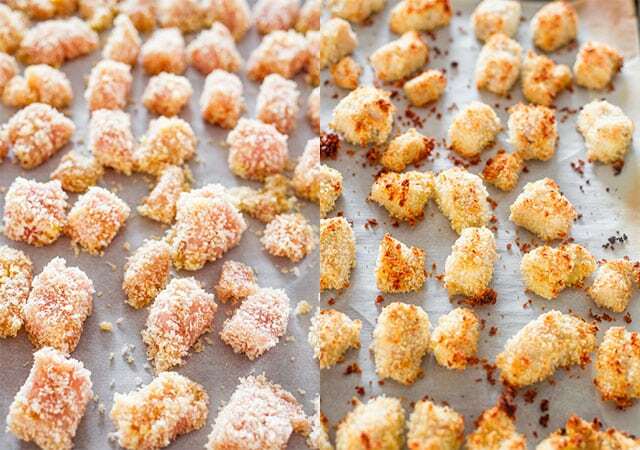 These tiny chicken morsels, all breaded are ready for baking. In just about 20 minutes, you have yummy chicken nuggets that are crispy, but not greasy. All they need is that delicious sweet, garlicky and spicy sauce that you can literally whip up in no time at all. Then you either drizzle it over the chicken, or dip your chicken in it and eat. Eat all you want, this is guilt free chicken. Here are some more great Chicken recipes that might knock your socks off! 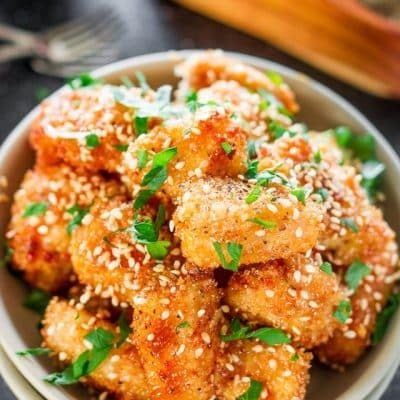 Baked Honey Garlic Chicken - little chicken nuggets, breaded and baked to a crispy perfection, then drizzled with an amazing sweet, spicy and garlicky sauce. In the meantime add all the sauce ingredients to a small sauce pan. Bring to a boil over medium heat, then turn down the heat and cook for a couple more minutes stirring occasionally. 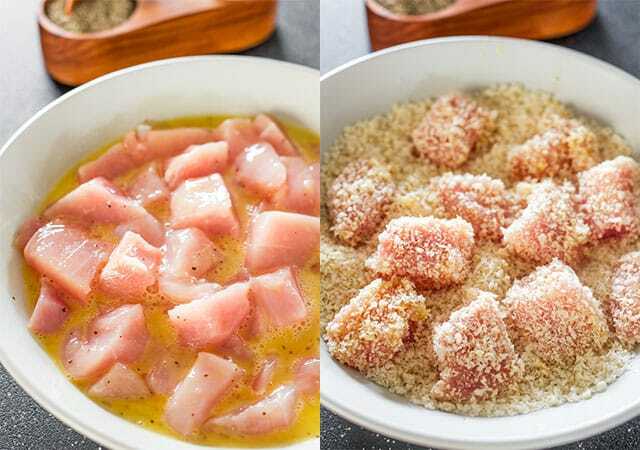 Pour sauce over chicken and toss so that the chicken pieces are fully coated. If there's left over sauce, use for dipping. Garnish with sesame seeds and parsley if preferred. Serve over rice and/or veggies. I made it to put in my daughter’s sandwich less lunch. Very good! Nice crisp. I seasoned the breadcrumbs before rolling the chicken in it. I kept the sauce separate for her lunch so she can drizzle when she’s ready. This recipe is a keeper. That sounds amazing! We’ll have to try that next time. Can honey be heated, I have read somewhere that honey when heated is not good for health. Any idea? Really want to try the recipe. I made this last week with some food I had left over in the house, and it was fabulous…so simple and satisfying! This was the first recipe of yours I’ve tried, and I’ll definitely try more. I’m planning to make it for my boyfriend tomorrow night with rice…any vegetable suggestions? I did it up with broccoli and water chestnuts. Yum. I see you have the nutrition information at the bottom of the recipe. Thanks for including that. Just wondering the amount of the actual serving size that the information is based on. It says serving size is about 203g, so probably about 3/4 of a cup. I made this tonight and my husband said “It was spectacularly good!” The whole family raved about it! This recipe is a keeper. Superb recipie! !Chicken was cooked like nuggets ..I cooked it 5-8 min more than mentioned as I wanted to make sure chicken gets cooked completely.The sauce was so yummy and easy to make. Thanks for the awesome recipe ?? This sounds delicious! Making my grocery list now! I’m trying to find freezer meals…gets crazy in this house…think the honey garlic chicken is a good candidate? Thanks! 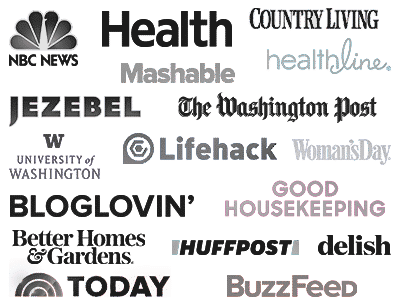 I had been looking for an alternative to standard frying for recipes like this. The first time I made this dish, my husband was out of town and my PICKY BEYOND BELIEF 8-year-old son told me, “This is so good, you should open a restaurant.” Trust me…coming from that kid, that’s something special. 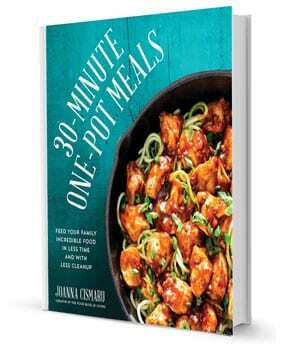 This recipe is perfect/delicious/wonderful exactly as is, but I’m also thrilled to have a new way of preparing things like sweet & sour chicken, orange chicken, etc. Bravo! And THANK YOU FOR SHARING! I’ve had this saved on Pinterest for a while but just got around to making it. I didn’t change a thing, it’s absolutely wonderful! I’m writing this review as I eat this and it’s delicious. I had all the ingredients on hand sans the parsley. It’s very fast and easy and I love that no frying is involved. 20 min at 375F worked perfectly for me. Next time I will double the sauce and probably use it for dipping. The panko crust is delicate and some fell off while tossing it with the sauce. It also gets soggy quickly and loses the fantastic crunch. Thank you!